BLOOMINGTON—Homecoming week at Indiana University is traditionally a time for football and friends. But for some students, Oct. 14 was set aside for a different kind of homecoming. “This whole semester, we are focusing on the Eucharist,” said Liz Whitmore, a 19-year-old sophomore at IU and member of the Student Life Team, which plans all the events for students at St. Paul’s Catholic Center in Bloomington. “We are taking Jesus to the streets,” she added. Hoping to promote a deeper understanding of the Eucharist, Whitmore suggested that the team organize a eucharistic procession—a solemn, prayerful walk of the faithful led by the clergy, who carry the Blessed Sacrament displayed in a monstrance to stir devotion, give thanks and ask for God’s help. Participants included Indiana University students, members of the Knights of Columbus, and parishioners from St. Paul, St. John and St. Charles Borromeo parishes. “I thought it was a tremendous way to become a more visible presence on campus,” said Dominican Father Stan Drongowski, the associate pastor of St. Paul Catholic Center. 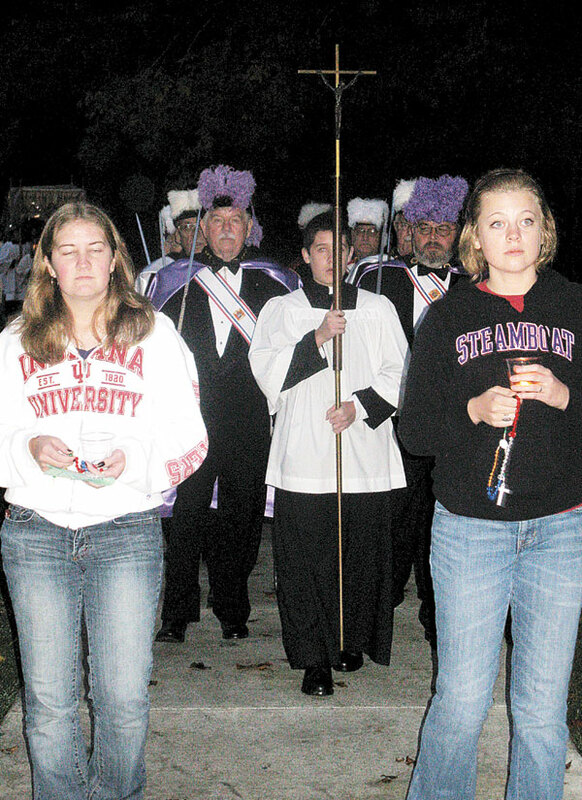 Monica Siefker, a member of St. John the Apostle Parish and an IU graduate, said she felt God’s presence during the procession. Sharing the experience with her six children and her husband, Dale, on the campus where the couple met was an indescribable joy, she said. “That night was a true homecoming!” she said. Siefker said her children, who range in age from 4 to 15, were thrilled to be a part of the procession. Organizers hope that the eucharistic procession will become an annual event.